About 200 people gathered Wednesday outside Montreal's St-Luc Hospital for a silent vigil in honour of an employee killed by a stray police bullet. Patrick Limoges, 36, worked at the downtown hospital and was on his way there Tuesday morning when he got caught in the crossfire of a police operation and died. 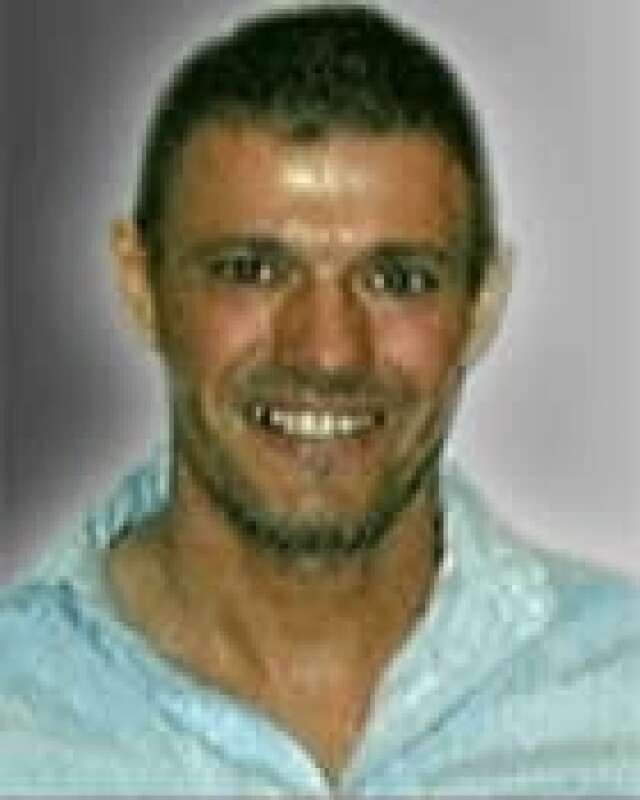 Patrick Limoges, 36, was killed by a stray bullet. 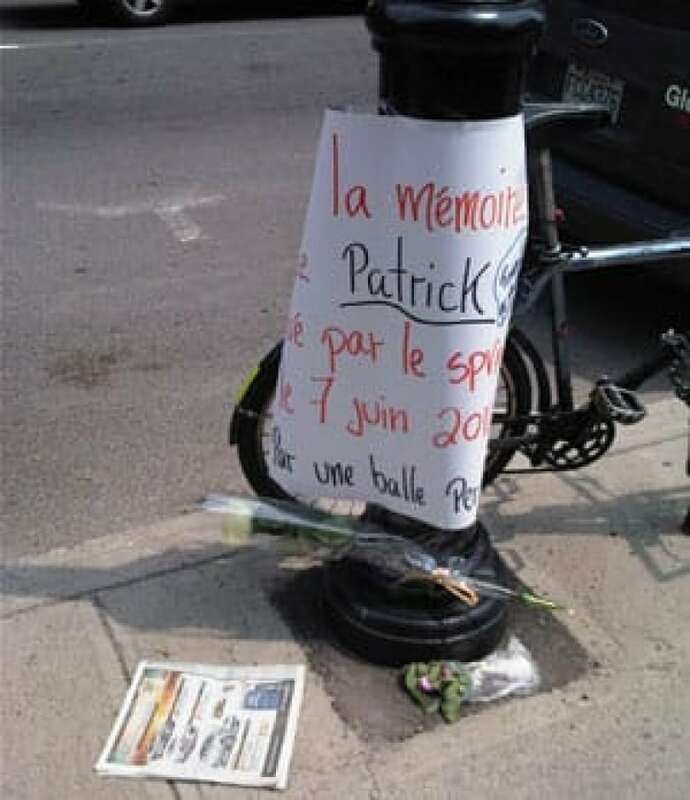 ((Radio-Canada))Maintenance workers and other hospital staff streamed out of their building at noon Wednesday, crossed René-Lévesque Boulevard and blocked traffic for their impromptu vigil. They stood in silence for five minutes near the spot where Limoges was struck, and where bloodstains were still visible. Most employees at the hospital didn't want to publicly speak to media, but said the death is shocking and that they feel any one of them could have been the one killed. "It's very hard on everyone. We're all asking why, and did police do their job correctly?" said Odette Caouillette, who works at the hospital. Limoges was hit by a police bullet as officers were pursuing a suspect through the downtown core early Tuesday morning. Flowers are laid at the spot where Patrick Limoges was shot Tuesday. (Peter Akman/CBC)Police were chasing Mario Hamel, who they say was brandishing a knife and overturning garbage cans. The officers approached Hamel around 6:40 a.m. Tuesday, confronting him on St-Denis Street near Ste-Catherine Street. They opened fire on Hamel, and Limoges — who happened to be passing by, possibly on his bicycle — was hit by one of the police bullets. A bicycle was found near the spot where Limoges fell. Quebec's police service has taken over the investigation, as provincial law requires when police are involved in a shooting. Hamel was a resident at the Maison Eugénie-Bernier, a transitional housing centre for homeless people run by the Accueuil Bonneau on St. Denis Street. Officials there say he had been receiving psychological help and was able to get himself off the street. However, one of the mission's co-ordinators said his mental health problems seemed to be getting worse. "Up until about a few weeks ago there was no problem, but then he realized he wasn't doing so well. We tried to help him see a doctor, but he refused, said Lise Ouellette, who added that Hamel was "never physically aggressive." with the staff or clients. 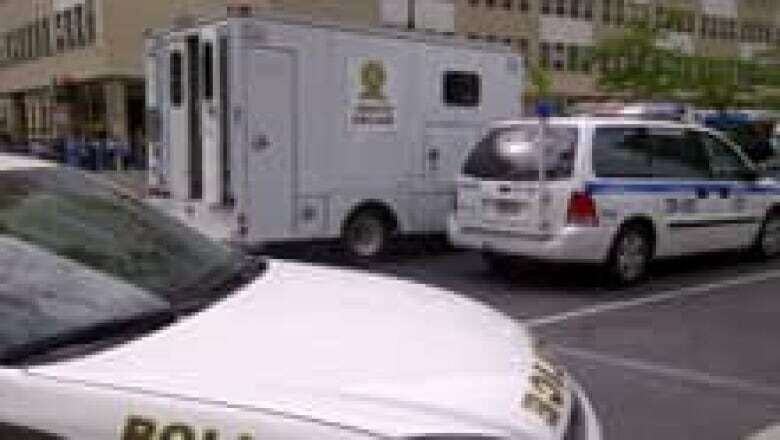 "He had made some progress," the mission's director general Aubin Boudreau said. "It's a shame his life ended like this." 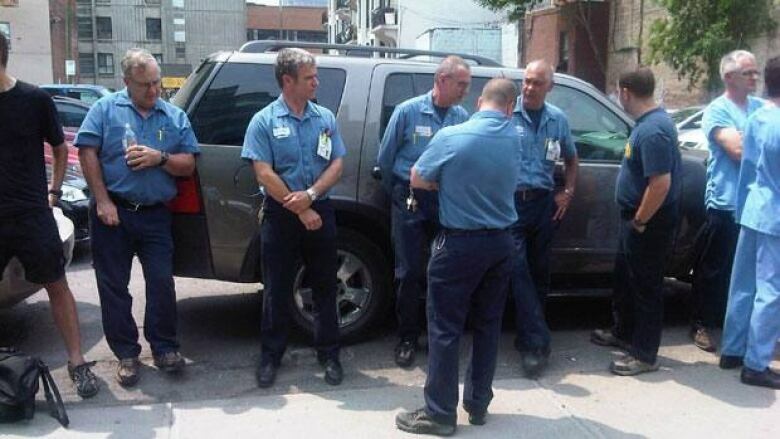 Quebec provincial police have taken over the shooting investigation in Montreal. ((Steve Rukavina/CBC))It's not the first time this year that city officers have been investigated after fatal shooting incidents. In January and February, the force was involved in three incidents over three weeks, two of them resulting in deaths. When asked Wednesday about the latest incident, Quebec's Public Security Minister Robert Dutil said there is no pattern of police being overzealous with their firearms. Dutil said that statistically, there are very few shooting incidents each year involving police.